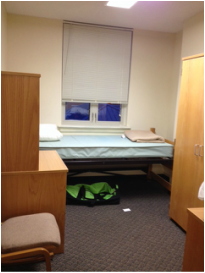 I thought I would share a few photos of what the living situation was for the week. 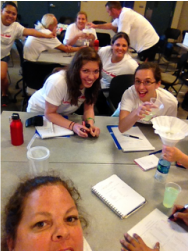 The teachers stayed at the University of Alabama-Huntsville dorms. 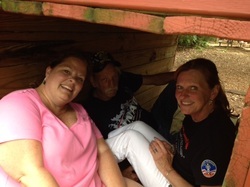 We each had our own sleeping quarters, and shared a shower, toilet and sink with one other person. It was a pretty tight squeeze. The bed was really high. Not great for someone who is vertically challenged. 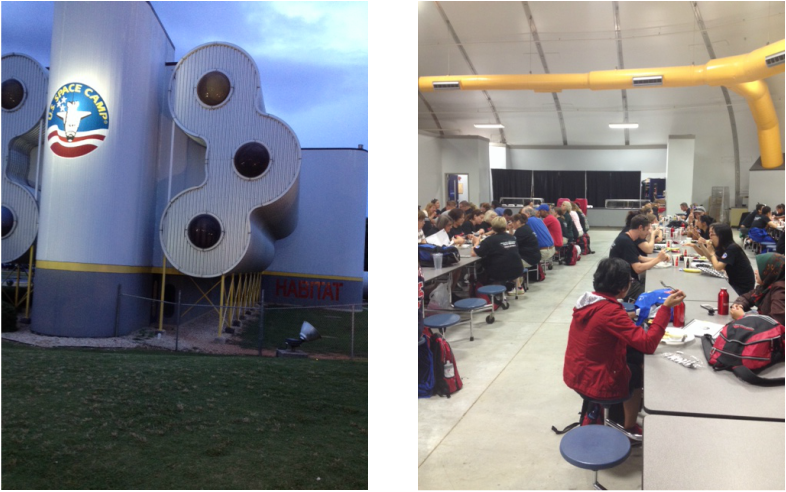 When kids and families come to Space Camp, they stay on the Rocket Center property. The building below has 4 floors. 3 are for boys and 1 is for girls. The girls have another building as well. Families stay together in rooms. The rooms have about 7 beds in them and lockers for the kids to store their personal items. Lights out is at 10:00 every night. The rooms look very 'space-like' and so does the building. Everything is surrounded by a tall fence with security, so the kids are safe. The food was okay. It wasn't bad, but it wasn't good either. It was served cafeteria style. Teachers could sit wherever they wanted, but at the kid camp, kids sat with their team. 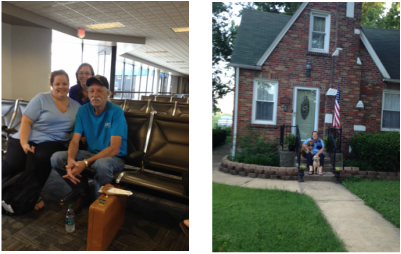 I was waiting at the airport with two of my teammates, Anne Marie from Maryland and Art from Oklahoma. We were ready to go- but were still smiling! The dogs were so excited when I finally arrived home. Special thanks to the following people who helped make this trip possible: Erich Peltz, Melissa Tackett, Bill Howell, Barb Bushnell, and The Duemlers. I was able to enjoy myself knowing that everything was taken care of back home! I learned so much and had a real blast! My friend, Kim, from Oregon, is showing her scaled version of the solar system. We will probably make these next year. 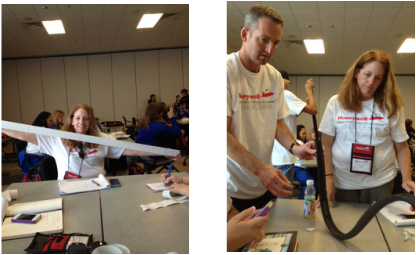 The next photo is Tim, from South Africa, and Kim working on a roller coaster activity. We had to include a hill, gap, loop, another hill, and end with out the marble falling off the tube. It was a lot of fun. Our next stop was a biochemical engineering company based in Huntsville. 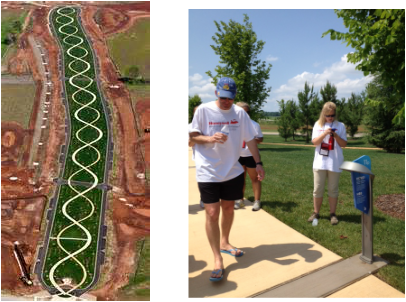 HutsonAlpha Biotechnology created a really cool walking park in the shape of a DNA double helix. They have set it up so that kids can go there and do a geocaching activity where they learn about the different chromosomes. We used an app on our iPhones to do this. You can see Tim and Denise doing this at one of the chromosome stops. The other photo is an overhead shot. I loved it! We had to cool off for a bit after that walk. Huntsville is really hot. We are used to the humidity here in Missouri, but some people were getting overheated. Luckily, lunch was next. After lunch we talked to Dan Oates. He is one of the administrators at Space Camp. He talked about camps the center offers for hearing impaired, blind, handicapped and even little people. In Missouri, blind students can attend for free. Contact the St. Louis Lighthouse For The Blind if interested. 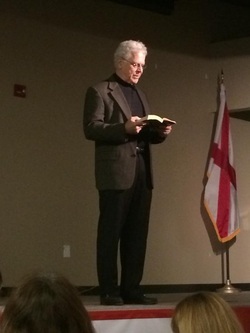 Homer Hickam was our next speaker. He wrote the book Rocket Boys which was made into the movie October Sky. In the book, Mr. Hickam wrote about his teacher, Miss Riley, who encouraged him to experiment and follow his dreams. He went on to become a rocket engineer with a minor in English. He recently finished a new Sci-Fi series for adolescence and young adults called The Helium Series. It looks really good. He spoke about Miss Riley, who died of cancer at a young age. She would ask him, "Did you do your best?" When he replied that he had she would say, "I think you can do better!" He reminded us that the teachers we remember are the ones who challenged us and had high expectations. He gave each one of us a personalized, autographed, hard back of Rocket Boys. Graduation was next. We all put on our flight suits and went through a very serious ceremony. We recieved our certificates and our 'wings'. These are pinned on my flight suit, which I will keep in the classroom next year. 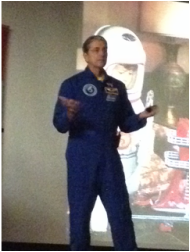 During graduation, astronaut Hute Gibson spoke. He was on 5 Space Shuttle missions. For 4 of them he was the commander. He was also a Top Gun pilot for the Navy. Alabama State Senator, Bill Holtzclaw, also gave an inspiring talk about encouraging our students to dream. Below is a photo of me with Commander Gibson. 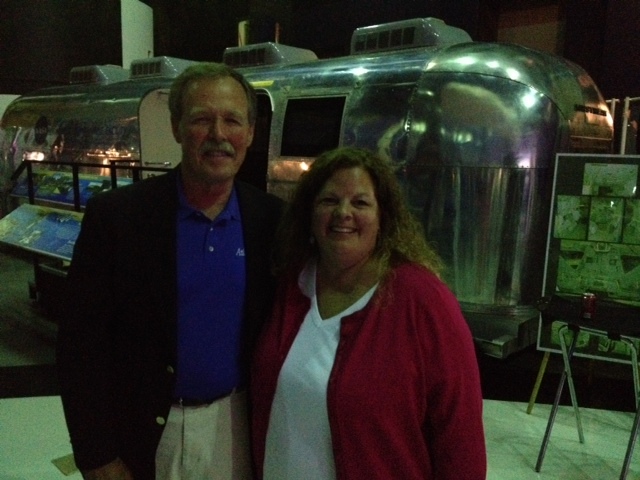 Behind us is an old, Airstream camper that was used to keep the astronauts quarintined after thier flights during the Apollo years. They had bunks, a kitchen, and a bathroom to share for a few days while scientists made sure they weren't bringing back strange diseases from the moon. After the ceremony, we went to a fancy dinner right in the middle of the museum. We were all tired, but we had a great time celebrating our success! Tomorrow I will add more about the final travel day and opportunities Space Camp has to offer for kids, teachers, and families! Sunday was a very busy day! In the morning, we had a Space Shuttle simulation. The shuttle was going to the ISS to make some repairs. and exchange astronauts. I was the GNC which was the person who works in Mission Control to assist the Commander when it is time to deploy things. This was much less physical than the Lunar Mission. You might remember, I had to scale a wall to repair solar panels in space. I am one of the people in the space suits! 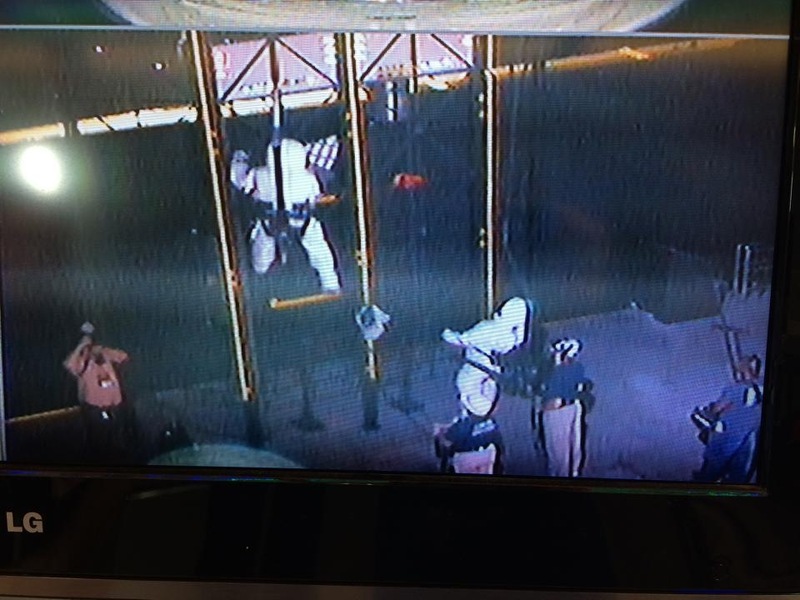 Below is a photo of the video from that mission. 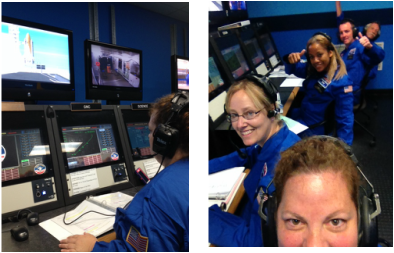 By the way, both missions were a success- we did not leave anyone out in space! After lunch, we took some time to look around the musuem a little bit. There is so much history there! I know some of you are interested in how the astronauts went to the bathroom on the Appollo missions. These two pictures say it all! The clear bag is for #2, The yellow bag is for #1. They wore these in their suits! YUCK! OUT OF THIS WORLD FACT: NASA has invented many products to be used in space, some of these items became staples in the average household. Velcro, aluminum foil, and disposable diapers are just a few. 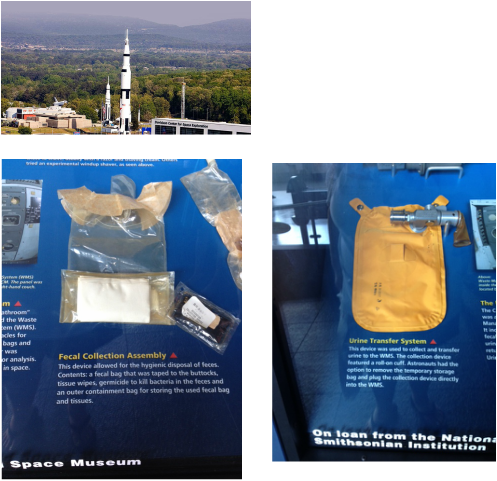 Think about why they needed diapers in the Mercury and Gemini missions. Our afternoon missions were all in the water! This first one was a water rescue. When the earlier spacecrafts had to 'splash down', the astronauts had to be scooped out of the water and pulled up into a helicopter. The second one is a helicopter rescue. Everyone gets in the big, green tube (helicopter fuselage) and it is submerged- well almost compeletly submerged. The team has to climb out a window and swim to safety. We had one teacher on our team that couldn't swim. She did a fantastic job! It was great to see her conquer her fears! Very touching! 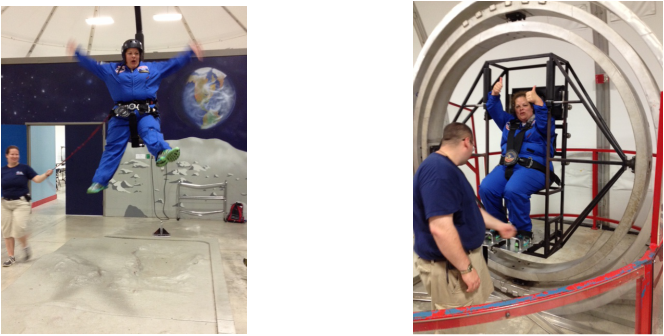 Finally, we were able to simulate a parachute landing- sort of. We went down a zipline backwards and landed in the water. It was so much fun! This screen shot of a video is not that flattering, but boy was it fun! Most of you know how much I love the water. This was one of my favorite activities. 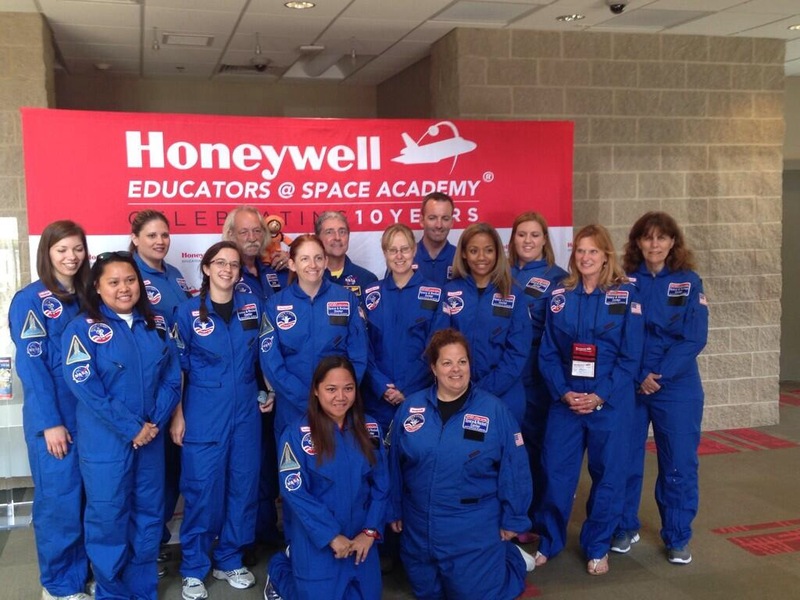 After dinner, some Alumni Teachers came to speak with us about how the Honeywell Space Academy for Teachers helped them in their classroom. They were very enthusiastic! This was also a new friends birthday, so after all that- we went out to celebrate! It is so much fun to socialize with teachers. Some of them can really cut loose! This morning we had to build an Ablation Heat Shield. This was to represent how the tiles on the Space Shuttle deflect heat during re-entry. Did you know the tiles are 90% air and only 10% silca? 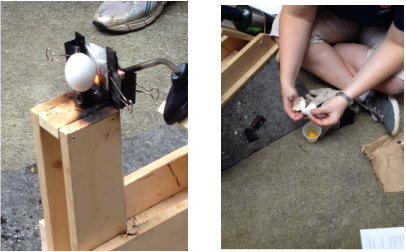 We had to protect an egg from a blow torch. We used foil, spackle, sponge, and steel wool. Unfortunately, our egg was slightly cooked after our required 3 minutes of flame! Poor little egg! Our Lunar Simulation was next. 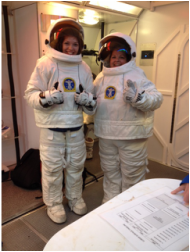 My buddy Sara and I were Lunar Mission Specialists. 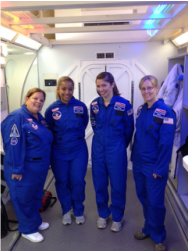 We had to do a spacewalk and climb a tower to repair a solar panel- all while wearing this very HOT suits! Just like on the moon, going up was easy, but coming down was difficult because we are used to having gravity help us. We did repair the solar panels and our mission was a success! Hopefully, I will have video to add later! After this we were able to rest a bit while watching an Omnimax movie on the worlds largest telescopes found in Chile's Atacama Desert. I must admit, I rested my eyes a bit! We then created a Lunar Base that had to include an advertisement convincing people to come to the moon. My team created Lunaribbean: Where the Sun Never Sets! It was a resort that includes anti-gravity activities like Quidditch, an infinity skate park and Lunar Rover races. This is my rocket right before launch. I painted it 'Henderson Green' and used tape to put stripes and my name (and school district name) on it. Our next activity was really gross! We had to work on creating a urine filtration system. This is part of the ECLSS- Environmental Control Life Support System. Our team had to use various materials to create a system that would turn urine (it was lemonade with glitter in it) into drinkable water. We used a bottle, funnel, cheese cloth, charcoal, gravel, ammo, and a coffee filter. We had to get the PH level up from 3 to 7. As you can see from this 'urine selfie', we had a lot of fun, but our PH level only went up to a 4. 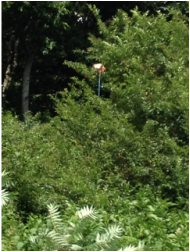 Look carefully and you can see our filtration system in the bottom right corner of the photo. Our last activity of the day was 2 simulators. The first was an anti-gravity chair. This is the same type of chair I used in the morning, but everyone else got a chance to do it too! The second is of a simulator that is similar to the MASTIF used in training the Mercury astronauts. Because your center of gravity remains the same, you don't get nauseous. It was a really busy day! Our first mission today was to become 'eggspert' engineers for an 'eggstronaut'. We had to build a rover and landing station for our little egg. We dropped it from 18 feet, then had to send it down a ramp. Only one team had an egg casualty- and it wasn't us. My team included teachers from all over the world. From L-R: Mexico, Maryland, South Africa, Florida- and St. Charles! 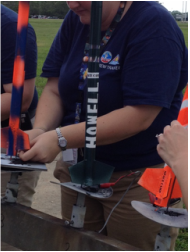 We built rockets today as well. We will be launching them on another day, so I will share photos then. I will say, mine is the coolest. 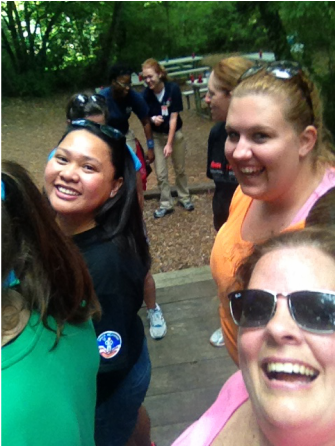 Our afternoon activity was a low ropes course. This is basically more team building activities. In this photo we are acting out a prison escape scenario-although I don't think real prisoners would be smiling so much! Art is from Oklahoma and teaches first grade. He carries a little, stuffed space bear that you may see in later photos. Dee Dee is from Oregon and is SO POSITIVE- as some of you know, this is a good counter balance for me! This is my lunar landing simulation team. We will be completing our simulation tomorrow. Wait until you see what I have to do! About this time I received a text that a dear friend's father had passed away. This made me very sad, as I realized I will not be home in time for the funeral. Then I thought about our astronauts and how much 'life' they must miss while they are out exploring new frontiers for us. What brave souls! Part of my lunar mission will be 'switching' crews with another team. 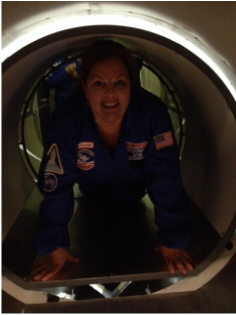 This picture is me re-entering the ship that will return me to Earth after months of working on the moon! After dinner, team Zarya began designing our Mission Badge. Each space mission from the Gemini to the ISS missions, have their own badges with symbols that have meaning to their specific trips. I'll let you know what we come up with. It was fun to work with my team today. We are getting along well. Just like students in the classroom, we do not always agree, but we do have to respect each other! Well, I made it! Our flight landed at about 11:00 am. The Space Camp people picked us up and took us to our dorm to 'freshen up'. 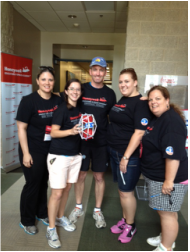 We were given a T-shirt, backpack, flash drive, water bottle, pen, etc. 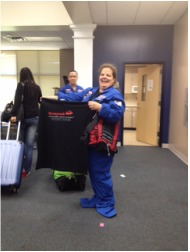 And oh yeah, our OWN SPACESUIT!!! Mine needed a little adjusting in the length! Dr. Don Thomas was our first guest speaker of the day. He flew on 4 Space Shuttle missions. He talked about the fact that he applied to be astronaut 4 times before being accepted. He was 39 before he finished all the training. Life Lesson- If at first you don't succeed, try, try again! Did you know that astronauts in the shuttle had to sleep with blindfolds on? They orbit the earth every 1.5 hours. So while they are trying to sleep they have 45 minutes of darkness, and 45 minutes of sunlight, over and over and over! Below is a photo of my team. We are Zarya. Zarya is what they called the first parts of the International Space Center. It is also a former secret Soviet space program from the 1980's. We had a 'debriefing' about the Space Shuttle before dinner. Tomorrow we are going to perform a simulation using the Canada Arms on the Shuttle. 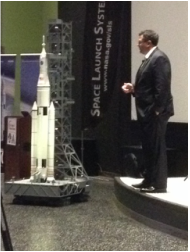 After dinner we listened to Todd May, the Program Manager for the Space Launch System (SLS). This is NASA's next big space project. By 2017 they hope to send an unmanned mission to deep space. By 2021 they plan on sending a crew into deep space. He even talked about sending a crew to Mars by 2036! FYI- the moon is only 200 miles from Earth. That is less than from Saint Louis to Kansas City. Mars is 54 MILLION miles from Earth! WOW! He talked a lot about past explorers and how children of today will be the 'Lewis and Clark' of the future, by exploring space. TREKKIE FACT- James T Kirk was named after the explorer James Cook. He sailed near Antarctica and also Hawaii. If space is the new ocean, then the solar system and planets are the continents and islands! The bad news is... we were half way from Dallas to Huntsville, AL, when we had to turn back. There was a plane crash on the runway in Huntsville and they shut down the airport! 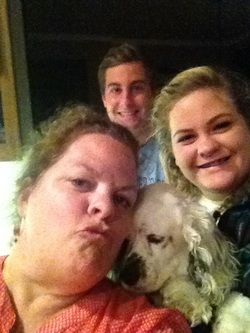 The good news is... my fabulous nephew, Hunter picked me up from the airport and I got to spend the night with The Lovely Lady Lauren, Hunter, and Junebug's sister, Payton! 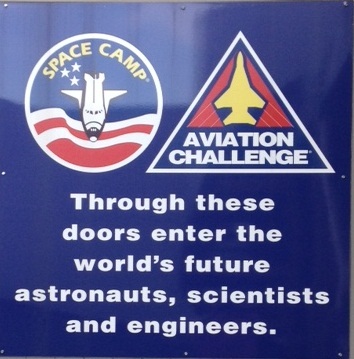 The next flight to Space Camp is 9:15 tomorrow! Tomorrow is the big day! My biggest concern is that the instructions said to bring your own pillow. 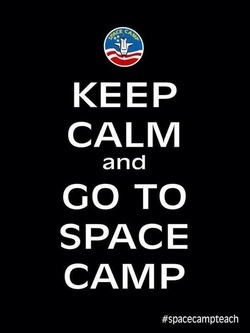 I am wondering just how much 'camp' is there in Space Camp! This blog is part of my gifted education website. I hope you enjoy! Please remember, students will be viewing this blog.